This page will have updated statistics of the restaurants that have appeared on the US version of Kitchen Nightmares. This will be continually updated, so feel free to bookmark it and share it with others. There are relevant links to the restaurant updates from this site, as well as links to reasons why restaurants have closed and how well they are rated. I have kept comments available on this page, so if you see anything I may have missed or have any updates regarding a restaurant status, feel free to leave a comment or contact us. Easton, PA Closed Closed just 3 1/2 months after Kitchen Nightmares filmed. The landlord kicked them out. They claim they want to open elsewhere. More Detailed Update. Redondo Beach, CA Open Still open with very good reviews and a lot of them. Keeps an up to date Facebook. More Detailed Update. Woodland Park, CO Closed Still open with mixed reviews as recent as 10/2014. Brought some menu items back. Closed in November 2014 More Detailed Update. Flushing, NY Closed Still open average to above average reviews, and have a lot of complements on the food. Closed in April 2014, shortly after their episode aired. More Detailed Update. 2 The Old Neighborhood Restaurant Arvada, CO Closed Restaurant was for sale when the episode aired. Stayed open for a bit, but closed in April 2016 - More Detailed Update. 1 Pantaleone's Denver, CO Open Still open with above average reviews and people raving about the pizza. Owner says they are still struggling. More Detailed Update. 1 La Galleria 33 Boston, Massachusetts Closed Still open with above average reviews, although there are some 1-star reviews mixed in. Closed in November 2018. 2 Mama Maria's Brooklyn, New York Open Still open with above average reviews. Keeps an up to date Facebook page. 4 Barefoot Bob's Beach Grill Hull, Massachusetts Closed Still open with below average reviews as recent as 4/2016. A lot of 1-star reviews. Keeps an up to date Facebook page. Closed in late 2016 - Info on closure. 5 Olde Hitching Post Restaurant & Tavern Hanson, Massachusetts Open Still open with average reviews as recent as 2/2017. 6 Levanti's Italian Restaurant - Renamed Levanti's American Bistro Beaver, Pennsylvania Closed Closed in November 2013 (despite a lot of positive reviews) with the owner saying he was retiring and wanted to get out of the business. 7 Sam's Mediterranean Kabob Room Monrovia, California Closed Closed in the summer of 2013 stating business never picked up after the show. 8 Nino's Italian Restaurant Long Beach, California Closed Still open with average reviews as recent as 4/2016. Recent reviews are much better. Keeps an up to date Facebook page. Closed in August 2016 - Info on closing. 9 Mill Street Bistro Norwalk, Ohio Closed Mill Street Bistro was renamed to Maple City Tavern in December 2013. There are a lot of complaints about the owner in local articles. Restaurant closed in 2/2016 - More info on the closing. 10 Yanni's Seattle, Washington Open Still open with above average reviews as recent as 1/2017. Reviews weren't too bad before the makeover. Keeps an up to date Facebook page. 11 Prohibition Grille - Renamed Prohibition Gastropub Everett, Washington Sold Still open with average reviews as recent as 2/2017. A lot of 1-star reviews filtered out. Sold to new owners mid to late 2016 and is still open under the same name. 12 Chappy's Nashville, Tennessee Closed The restaurant closed and was seized by the state of Tennessee in June 2013 due to unpaid taxes. Owner did a lot of complaining about Kitchen nightmares saying it ruined his business. 13 Amy's Baking Company Scottsdale, Arizona Closed Not enough words for this one. This was the first restaurant that Gordon walked out on, and the story went viral after that. Amy and Samy responded to people on Facebook calling them names. Pretty much all the reviews are people bashing Amy and Samy from the show and not actual diners. They plan to sell the restaurant and will close if the sale goes through - More Information. Amy's Baking Company officially closed on 9/1/2015 - Info on closing. 2 Leone's Montclair, New Jersey Open Still open with average reviews. 3 Mike & Nellie's Oakhurst, New Jersey Closed Closed in January 2012 according to their Facebook page, which was just a few months after their episode aired. 4 Luigi's D'Italia Anaheim, California Open Still open with average to above average reviews. Better reviews as of late. 5 Burger Kitchen Los Angeles, California Closed Was under new ownership in late 2011 around when the episode aired, and closed in February 2012. Owner thought online reviews killed the restaurant. More detailed update. 6 The Greek at the Harbor Ventura, California Open Still open with average to above average reviews. 7 Michon's College Park, Georgia Closed The College Park location has closed, but they have a small location in Atlanta, GA, and are opening another location in St. Louis. UPDATE - Atlanta location now closed and St. Louis location never opened. 8 El Greco Austin, Texas Closed Closed in December 2011, about 5 months after filming. Closed before their episode aired. 10 Spin-A-Yarn Steakhouse Fremont, California Open Still open with average reviews, but there are a lot of reviews for the restaurant. Some complaints about prices. 13 Chiarella's Philadelphia, Pennsylvania Closed Still open with above average reviews as recent as 3/2015. Closed in June 2015 - More info on the closure. 14 Zocalo Philadelphia, Pennsylvania Closed Closed around February 2013 and apparently had some unpaid tax issues. 1 Spanish Pavilion Harrison, New Jersey Open Still open with average reviews. Keeps an up to date Facebook page. 2 Classic American West Babylon, New York Closed Closed in August 2013 according to their Facebook page. 3 PJ's Steakhouse - Renamed PJ's Grill Queens, New York Closed Closed in May 2009 a few weeks after filming the episode, and was closed before the episode aired. 4 Grasshopper Also Carlstadt, New Jersey Closed Closed in October 2012, and a new restaurant is now in its location. 6 Down City Providence, Rhode Island Closed Closed in December 2011. Gordon's changes weren't liked by many old customers. 7 Tavolini Bridgeport, Connecticut Closed Closed in December 2010 just after Christmas. Was investigated by the Attorney General for selling gift cards right before closing. Owner said they closed due to medical reasons. 8 Kingston Cafe Pasadena, California Closed Still open with average reviews. Some complaints about service and price. Closed for a little, but reopened in Nov. 2013 with the same name. Closed in August 2018 - More info on closure. 9 La Frite Sherman Oaks, California Closed Still open with lots of reviews that are average to above average. Keeps an up to date Facebook page. Sold in 2016, closed in Oct 2017 - More info on closure. 11 Zeke's Metairie, Louisiana Closed Closed in October 2012, and a new restaurant is now in its location. 12 Oceana New Orleans, Louisiana Open Still open with a lot of reviews, many of which are above average. Keeps an up to date Facebook page. More detailed update. 1 Hot Potato Cafe Philadelphia, Pennsylvania Closed Closed in August 2010 according to their Facebook page. 4 Mojito Brooklyn, New York Closed Still open with average reviews as recent as 4/2014. A lot of 1-star recent reviews. Keeps an up to date Facebook page. Closed in 3/2016 - More info on closing. 6 Le Bistro Lighthouse Point, Florida Open Still open with above average reviews. One of the top rated restaurants for Lighthouse Point on Tripadvisor. 7 Casa Roma Lancaster, California Closed Still open with minimal reviews. Changed names at one point, but it is back to Casa Roma now. Closed at the end of June 2017 - Info on closing. 8 Mama Rita's Newbury Park, California Closed Closed in December 2010, but the owner Laura is still doing catering. 11 Sushi-Ko Thousand Oaks, California Closed Closed in August 2009, a few months after filming. Closed before the episode even aired. 1 Handlebar Mount Sinai, New York Closed Closed in 2009, not long after the episode originally aired. 3 Trobiano's Great Neck, New York Closed The restaurant closed in October 2008 after it was seized for not paying taxes. This was not long after the episode aired. 4 Black Pearl New York, New York Closed The restaurant closed in September 2008 just days after the episode aired. 8 Sabatiello's Stamford, Connecticut Closed Closed in December 2008, and the owners opened another restaurant in Greenwich, CT, which also later closed. 10 Santé La Brea Los Angeles, California Closed Closed in June 2011 according to their Facebook page. 11 Cafe 36 La Grange, Illinois Closed Closed in April 2009, a few months after their episode originally aired. 1 Peter's Babylon, New York Closed Had bad reviews after Gordon left, and closed in December 2008. 4 Seascape Islip, New York Closed Closed around October 2007(same month the episode aired)and a new restaurant has opened up in its place. 5 The Olde Stone Mill Tuckahoe, New York Sold Was sold to new owners in 2009. Restaurant still goes by the same name and has average to below average reviews. 8 Lela's Pomona, California Closed Lela's closed by the time the episode aired on TV because the debts were too high. 10 The Secret Garden Moorpark, California Closed Still open with average to above average reviews recent as 5/2015. Better reviews as of late. Keeps an up to date Facebook page. Closed in 11/2015 - Info on the closing. Also if you watch Bar Rescue, visit Bar Rescue Updates for updates on that show. See Food Network Gossip for Restaurant Impossible Updates and how many restaurants are Open vs. Closed. Why does g.r. do this show when some business are way to far in debt.he should know even a rest making 5 grand a night can't pull out of a million dollar debt. Yet he does the show anyways.which makes me curious why ? people find it entertaining. guess it beats terrorism, Ebola & missing planes.. I love Gordon Ramsay and this show. It's too bad that so many of the restaurants close even after his help. The show makes it seem as if they have great potential for success when Gordon leaves. I would love to see more update shows to ssee what happened after. What ultimately led to their closing and how long did they last? Do the people not change as promised? Is the debt to heavy? I was very surprised to see the failure rate. 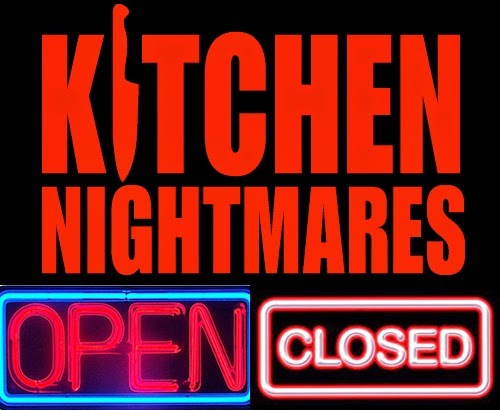 Kitchen Nightmare's Updates Is In No Way Affiliated with Fox's Kitchen Nightmares. Simple theme. Powered by Blogger.